When Nicholas Longrich discovered a new dinosaur species with a heart-shaped frill on its head, he wanted to come up with a name just as flamboyant as the dinosaur's appearance. Over a few beers with fellow paleontologists one night, he blurted out the first thing that came to mind: Mojoceratops. "It was just a joke, but then everyone stopped and looked at each other and said, ‘Wait — that actually sounds cool,' " said Longrich, a postdoctoral associate at Yale University.”I tried to come up with serious names after that, but Mojoceratops just sort of stuck." With the publication of Longrich's paper describing his find in the Journal of Paleontology, the name is now official. 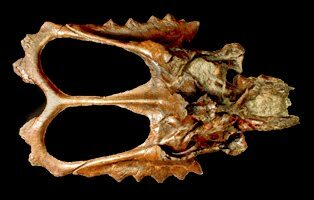 The dinosaur is one of more than a dozen species belonging to the chasmosaurine ceratopsid family, which are defined by elaborate frills on their skulls. A plant eater about the size of a hippopotamus, Mojoceratops appeared about 75 million years ago during the Late Cretaceous — 10 million years earlier than its well-known cousin, the Triceratops. The species, which is related to another dinosaur in Texas, is found only in Canada's Alberta and Saskatchewan provinces and was short-lived, having survived for only about one million years. It was only after coming up with the unusual name that Longrich looked into its etymology. Surprisingly, he found that it was a perfect fit for the species, which sported a flamboyant, heart-shaped frill on its head. While all ceratopsids have frills on the tops of their skulls, "Mojoceratops is the most ostentatious," Longrich said, adding that their frill is also the most heart-shaped of all the related species. Longrich got his first clue that he might have found a new species at the American Museum of Natural History in New York, where he was studying the dinosaur fossil collection in 2008. There, he found a distinctive frill that didn't match anything previously known. Later, while sketching the skull of another specimen on display, which was thought to be a species called Chasmosaurus, he noticed the skull was identical to the one on the specimen next to it. "I realized the skull on the supposed Chasmosaurus must have been a reconstruction," he explained. When he studied the front of the skull, Longrich noticed some differences from the typical Chasmosaurus, including longer horns than usual. Trips to other museums in Western Canada turned up more examples that didn't fit with the rest of the known species. "The fossils didn't look like anything we'd seen before. They just looked wrong," he said. Finding yet another previously unknown large dinosaur species that comes from Dinosaur Provincial Park in Alberta, Canada-which boasts the world's most diverse dinosaur fauna-was somewhat surprising, Longrich said, because the fossils have been studied for such a long time already. "So far, we really have no good explanation for why there are so many dinosaurs in the area and just how they managed to coexist," he said. All in all, Longrich turned up eight partial skulls of the new species, which now boasts a name with just as much flair as its unusually shaped head. "You're supposed to use Latin and Greek names, but this just seemed more fun," Longrich said. "You can do good science and still have some fun, too. So why not?"